Monday was a terrible day for investors as the Dow lost 758 points at one point. Here are several quick takes from various sectors TheStreet covers. Dow Off Sessions Lows But Still Down 459 Points. Watch What Happened Now! The bulls got stampeded on Monday. At one point on the session, the Dow Jones Industrial Average lost 758 points. It closed down 459 points. The S&P 500 and Nasdaq Composite each entered correction territory, down 10% from an all-time high. A one-time hot tech stock such as Netflix (NFLX) was smashed by 5.1%. Even high-yielding General Electric (GE) , by no means a fundamentally solid company at the moment, tanked 3%. Here are several observations on the session across TheStreet's newsroom. So much for oil being a bright spot. Oil stocks were slammed Monday as prices tumbled amid fears of a trade war between the U.S. and China. U.S. benchmark West Texas Intermediate futures contracts for May delivery fell 3.2% to $62.85 at 5 p.m. New York time. Brent crude futures, the global benchmark, fell 2.7% to $67.49. The Energy Select Sector SPDR ETF (XLE) , which holds oil giants including Exxon Mobil Corp. (XOM) , Chevron Corp. (CVX) and Action Alerts Plus holding Schlumberger Ltd. (SLB) , fell 2% to $66.06. WTI futures had been rising above $65 a barrel headed into the week after the long holiday as the decline in active rigs eased some concerns about surging shale production. U.S. oil producers brought seven rigs offline for the week ending March 29, cutting the U.S. oil rig count to 797, according to oilfield services giant Baker Hughes. While it was the first decrease in oil rigs in three weeks, there are an additional 135 active oil rigs than there were during the same period last year. Investors searching for early signs of an impact from the budding U.S./China trade war need not look any further than oil prices. If declines persist, it may signal economic slowdowns in each country later this year. 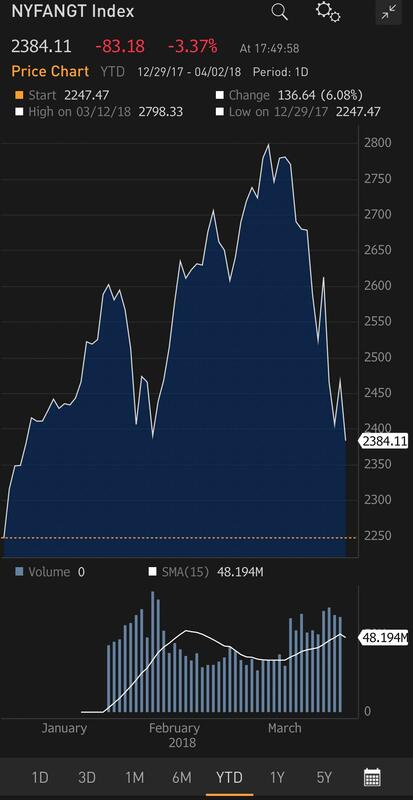 Beset by concerns about regulation and government action, Big Tech continued to weigh the broader market down on Monday. This time, though, there was an assist from chip stocks, as a report that Action Alerts Plus holding Apple (AAPL) would be ditching chips made by Intel (INTC) in its Macintosh personal computers sent Intel's shares down as much as 9%, although they closed down 6%. The Philadelphia Semiconductor Index (SOX) fell 3.7%. Overall, the Nasdaq fell 2.7% on Monday, turning the index negative for the year. Among notable losers were Action Alerts Plus holding Amazon (AMZN) (down 5.2%), Tesla (TSLA) (down 5.1%), Netflix (down 5.1%) and Action Alerts Plus holding Nvidia (down 4.6%). The only big cap tech company that emerged relatively unscathed was Apple, likely on optimism about its move to design its own PC chips. The S&P 500 closed below its 200-day moving average for the first time since late June 2016. But it wasn't just that occurrence that should have investors spooked, it's how ugly the tape was for most of the session. Stocks coming off their lows into the close have all the feel of a sucker's rally on Tuesday morning that lends way to another nosedive later in the session.